Zones refer to specific areas on your website where ads display. Zones are set up with pre-defined sizes, such as 728 x 90. Advertiser graphics must fit the zone size exactly in order to display. If no ad campaign is assigned to the zone, it will serve a zero height space. Click Add New Zone to open the Zone editor. Select Active to display the zone on your website. Enter a Title for your zone. Choose a zone size in the Type field OR select Custom Size and enter the Custom Width and Height (in pixels) in the boxes that follow. You can enter notes about the zone in the Notes tab, if desired. Once a campaign has been assigned to a zone, a campaigns tab displays. 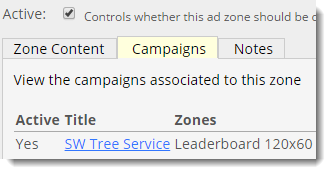 Use the campaigns tab to view all campaigns assigned to the zone. Click a campaign's link to open the campaign editor. Zones can be dragged to appear on a side bar or selected to appear in a designated spot on web pages.